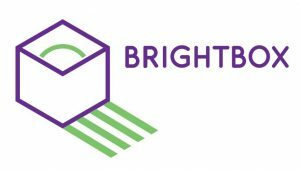 BrightBox opens her doors for participants of the Vertical Farming Conference and Agrifood Innovation Event in Villa Flora on 27 June 2018. 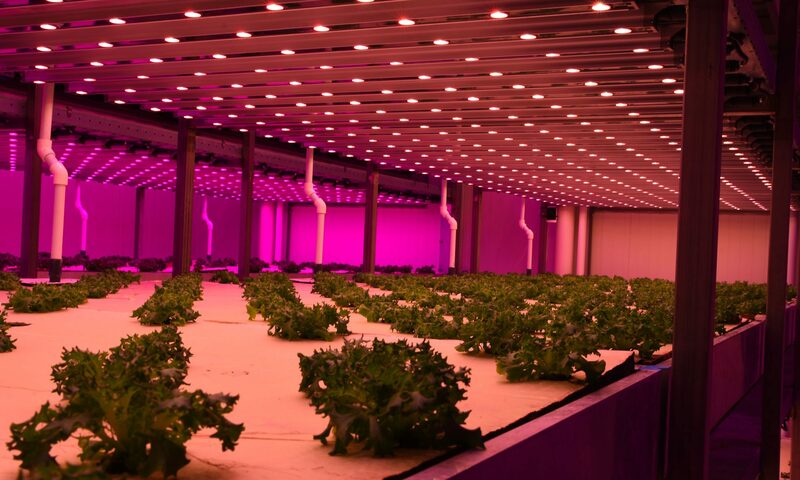 BrightBox is an expertise centre for daylight-free multi-layer cultivation, i.e. city farming. By determining the ideal growing formula for a plant – light, temperature, humidity, CO2, nutrition, water and substrate – we achieve the best results for the client. A higher yield, for example. A lower cost price, faster production, better quality or more delicious flavour. We research, produce, teach, and share our knowledge. Unique in Europe. In a closed environment, we open up the future of food. This is NOT a viable form of city farming! There is so much wrong with this approach. Nobody can afford to pay to shut out sunlight and then pay a fortune to try and recreate it. People now talk of value chains rather than simply supply chains. The carbon footprint per calorie for lettuce is already greater than that of bacon – so why go out of your way to make it bigger still when it could be reduced significantly? Nobody should be allowed to call this approach sustainable. Research funders went through a phase of seeking projects that delivered sustainable intensification. Vertical farming is intensive but not sustainable. Some go out of their way to claim it by suggesting they have exclusive supply contracts for renewable energy. Again this is a false claim. Even using LED lighting the amount of Solar PV needed to power them would cover the same area of farm land that could grow the produce (although it would not spread the crop across the seasons). In terms of plant science we also need to stop being so arrogant to expect a plant ot react well to being hit with 12 hours of midday light when they have evolved over many centuries to cope with light spectrums that change from dawn until dusk and in varying strengths and direction. Crops that taste good and have good eating qualities depend on these variations. It’s a bit like building a dragster and expecting it to win the Monaco Grand Prix! If you look at the economics of selling fresh produce in a city it is ridiculous for anyone to believe they should try and devote an individual building to growing it. That is why I loathe the term ‘vertical farming’. Using 1950’s warehouse shelving, adding expensive lighting and plumbing and still depend on manual labour completely misses the most important aspect – that of vertical integration. Most teenagers are taught the final mile of distribution is the most expensive – and therefore the one that should be avoided – especially for crops that cost most growers more to deliver than to grow. A good food retailer sells fresh produce because it brings customers in – not because it makes a profit. On average sales per square foot of fresh produce is only a fifth of store average but that is still more in a week than the facility highlighted can expect to grow in a year. Why would anyone pay several tens of thousands of times that of farmland and devote it to making such a poor return? Yet that same retailer has a roof they cannot use where sunlight is free and they already pay to dump heat, CO2 and huge amounts of transit only packaging. 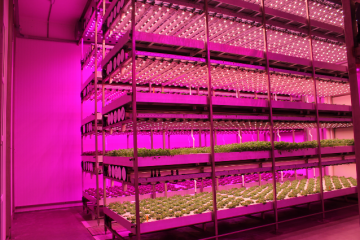 What we do need to do far more of is to understand how supplemental lighting can increase growth quality at the most advantageous time – such as adding red light in the final week of growing basil. This means only 20% of the growing area needs expensive lighting.